But questionable cultural practices aside, even evidence-based conservation science faces an ethical dilemma. Wildlife conservation focuses on protecting animals and habitats, but what happens when native species are threatened by animals that have been introduced to a country by human colonisation? When native species haven’t evolved to deal with the threats posed by non-native animals, they are at risk not only of being preyed upon but also from competition for food and contracting new diseases. While the idea that some animals should be killed to save others seems unethical, is it really at odds with nature conservation if we want to maintain biodiversity? Being passionate about wildlife conservation but also believing all animals have the right to life, conservation culling is a topic that has often troubled me. The decision on which animals to kill and which to spare is influenced by conservation aims and government and business agendas as well as the personal and cultural beliefs and biases of those involved. Neither a conservation scientist nor an animal rights activist, I’m not firmly in either camp, so I can understand the reasoning and emotion from both sides. Controversial culling operations in New Zealand, Australia and the UK show how attitudes, ethics, efficacy, and viable alternatives to culling have created conflict, dividing people across the world. Aerial 1080 poison is funded by the government to cull possum, stoat, rat and feral cat populations, which threaten to wipe out native bird species. The Department of Conservation (DoC) and NGO Forest and Bird advocate the use of 1080, or sodium fluoroacetate, bait pellets because it is highly effective, especially in expansive areas of impenetrable bush. The New Zealand Government wants a predator-free New Zealand by 2050—an ambitious aim described as NZ’s space program equivalent—but opinions on 1080 vary among conservationists, farmers, hunters, dog owners and animal rights advocates. The topic is highly controversial and divisive, even within communities, such as Maori in Northland. Some Maori claim they should be consulted about 1080 poison drops, under the Treaty of Waitangi, while others support DoC’s measures to restore Northland forests. Farmers don’t want to see their unfenced animals poisoned if they wander into baited bush, deer hunters aren’t happy about deer being non-target victims and dog owners don’t want to keep their pets on leads or avoid areas for a given period after a 1080 drop. Then there’s the animal welfare consideration that tops business or personal interests: death by 1080 is slow and painful. But, equally, bird enthusiasts don’t want to see the mainland fall silent as native birds are wiped out and conservationists know that birds play an important role in the forest ecosystem, especially through pollination and seed dispersal. Having lived in New Zealand, I know how impenetrable the bush can be, making predator control on foot difficult. Deploying traps isn’t cost-effective or even feasible in some locations. Having lived near the Manawatu Gorge, a target area for a 1080 drop, I’m also aware of how quiet the bush is where possums and stoats are prevalent compared to the birdsong heard in predator-free areas on the mainland like Wellington’s Zealandia Ecosanctuary, and offshore islands like Tiritiri Matangi. 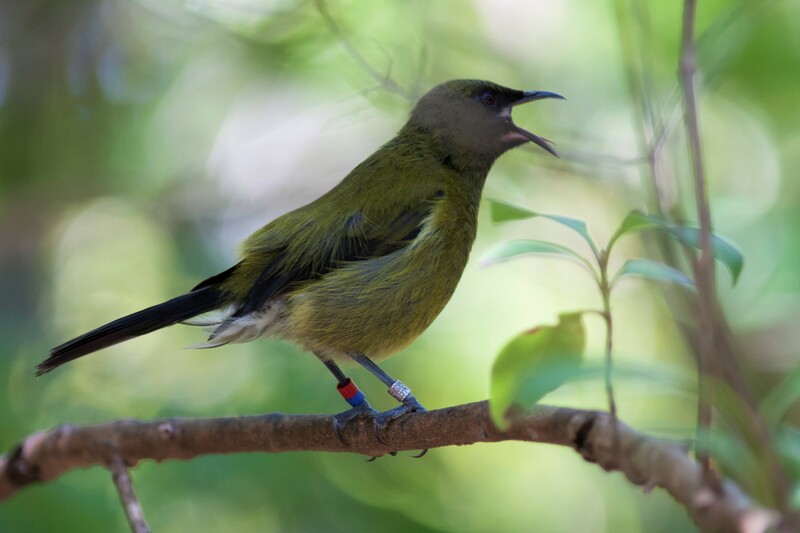 Native bird survival as well as New Zealand’s identity is at stake but what is the most effective, ethical and humane way to manage non-native invasive species? How can the national icon—the flightless, ground-dwelling, near-blind kiwi—be protected? Predator-proof fencing keeps predators out on peninsulas or in small areas so birds can recover or be re-introduced, but it is costly and impractical for larger areas. Considering the increase in predator populations, especially in years when there is a beech tree mast providing plenty of food, 1080 seems like the best option for protecting native birds until better alternatives are developed. Australia has its own battle to save native species. In 2015, the Australian government announced a controversial plan to cull 2 million feral cats by 2020 to save native bird, lizard, snake and small mammal species from extinction. Although arguably more humane, a trap, neuter, release (TNR) policy wouldn’t achieve results fast enough. In some Australian states, domestic cat desexing and containment is required, and publicly supported, which helps keep domestic and feral cat populations under control. On the ethics of culling, the Australian Government says, “Acting on feral cats is net-humane because it saves millions of native animal lives.” However, William Lynn, Research Scientist in Ethics and Public Policy at Clark University in the US says that although the war on cats in Australia and the US is driven by the moral responsibility for us to repair the harm we’ve done to nature, it’s based on unreliable data and ignores the value of individual animals while prioritising biodiversity. The idea of culling feral cats also causes outrage in New Zealand where both domestic and feral cats are feasting on native birds. Any policies to restrict ownership and movement have been unpopular. Whether in Australia, New Zealand, the US, or the UK, it seems cat owners are in denial about the impact of their pets on wildlife. So, should biodiversity take priority over individual animals or is there a middle ground? Another solution other than culling is the re-introduction of Tasmanian Devils to the mainland, which would keep feral cat numbers in check. The idea of rewilding as a means of controlling a species that had predators in the past is gaining ground in other countries too. In his book The Lynx and Us, ecologist Dr David Hetherington discusses the benefits of re-introducing the lynx in Scotland, a primary benefit being the natural control of deer numbers to protect woodland from over-grazing. In the UK, it’s the red squirrel at the centre of a culling controversy. The Government has declared war on the grey squirrel, an “invasive destructive alien species” that has caused the drastic decline of red squirrel populations in England and Wales. Conservation organisations are united in red squirrel protection, helped by an army of volunteers who dispatch greys regardless of whether they inhabit an area of red squirrel population or re-introduction. For some volunteers, such as Julie Bailey in Patrick Barkham’s thought-provoking article in the Guardian, their passion borders on obsession, driven not only by a desire to preserve biodiversity but by their emotional connection to the adorable reds. Do reds have more right to life than greys? Over the past year, I’ve had a grey squirrel visiting my garden, equally adorable and acrobatic, helping herself to my sunflower hearts. Legally, I can kill her for being grey (and non-native), provided I do so humanely. But do I have the moral right? Of course, I want to protect reds as well as the bird eggs and chicks taken by greys but having watched my grey visitor for the past year, could I accept her being culled, leaving her young to starve? And if we are going to cull greys, should we allow anyone to do this or should the killing be overseen by conservationists? In New Zealand, deer hunters mistakenly shot rare takahe in a culling operation to reduce numbers of pukeko, a bird of similar plumage. Conservationists wouldn’t have made this identification error. And in the US, a black bear cull in Florida in 2015 outraged the public when some hunters ignored regulations; they illegally used baits and shot cubs and nursing mothers in a blood sports frenzy when the aim was to cull old or sick bears. If we cull animals, let’s make sure science and ethics drive the killing rather than emotion or sport, and if there’s a viable alternative, let’s take it. We also need to consider carefully the justification for culling and the impact if things get out of hand. In the 1950s, the fatal virus myxomatosis arrived in the UK and authorities allowed the disease to wipe out rabbits, which were seen as an agricultural pest. Although rabbits are an introduced species, they have lived in the wild in the UK for so long—since the 12th Century—that some natural environments now depend on them. Landscapes such as the Brecklands in Norfolk depend on rabbits grazing the vegetation to maintain wildlife biodiversity but rabbit numbers have fallen to the extent that conservationists are now so worried, a Back From the Brink project has been set up. More recently, myxomatosis has been found in brown hares, a species already suffering a drastic decline in the UK, suggesting the virus has jumped species. Humans hold power over animals by destroying their habitat, depleting their food sources, polluting their environments and exploiting them when it suits. Culling some animals to save others will always divide opinion but unless we want to witness mass extinction caused by human activities, and be left with only a few species, we must restore the balance. If we consider the science, prioritise animal welfare, minimise suffering and exclude vested-interest agendas while urgently looking for more humane or natural solutions, such as reproduction control or rewilding, we can ensure we cause the least harm. That is our ultimate responsibility as guardians of nature. ← Have you seen the latest Wildlife Blog Collection?